"Japan should stabilise its population about 100 million people, stemming an expected dramatic fall in the next 50 years in the rapidly greying country. If the plan is adopted by the government, it would be the first numerical population target in the country. The population of 127 million is projected to fall to about 87 million in 2060 because of a far-below replacement fertility rate and the almost complete absence of immigration. That would have potentially huge knock-on effects on the size and vibrancy of the economy, and will heap ever-increasing pressure on a shrinking workforce to provide care for a larger group of pensioners. In its interim report, released on Tuesday, a government panel proposed Japan should take measures to halt the population slide so it goes no lower than 100 million people. The panel estimated that if Japan's total fertility rate - the average number of children born to a woman - recovers to 2.07 in 2030 from the 1.41 in 2012 and stays at that level, the country's population will be about 100 million in 2060. In its report, the panel called on the government to double its support for parents to make childcare easier, while encouraging senior citizens to work longer to help offset the cost of their old age. The panel also suggested Japan accept more foreign skilled workers to boost the labour force. Previous such suggestions have fallen on deaf ears in a country that views immigration with suspicion. Economic and fiscal policy minister Akira Amari said the government planned to reflect the proposals in its guidelines on economic and fiscal policies to be released in June. "We hope the government will share our sense of crisis," Akio Mimura, the panel's head and chairman of the Japan Chamber of Commerce and Industry, said at a panel meeting, a cabinet Office official said. Source: AAP 13 May 2014 - 6:02 PM UPDATED 13 May 2014 - 9:40 PM"
The Japanese are a national group of tribes of Pacific Islanders who occupied and organised land-tenure in this region for millenia without advice from globalist entrepreneurs. 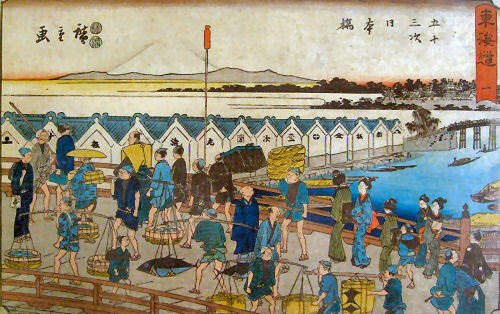 During the Edo Period, when Japan’s population numbered around 33 million, total cereal dependency was probably around 90 percent, with 6 percent provided by soybeans and azuki beans, and a further 6 percent by potatoes and sweet potatoes, plus fresh vegetables, fruit, fish, and meat, when available and/or in season. Remarkable changes took place in the Japanese diet from the 1930s to the 1990s. The increases and decreases are symbolic of the changes that have taken place in Japan over the last 70 years (the mid-thirties was the period when buses, trains, and telephones were beginning to change patterns of life in rural Japan) and over the last 40 years, since the inception of the drive to industrialization and economic growth. With the exception of wheat consumption, which rose 4-fold, direct cereal consumption decreased generally. Intake halved of the traditional soybean-foods, miso and soy sauce. Consumption of milk and other dairy produce increased 28-fold (4-fold since 1960), along with oil and fat, which rose 15-fold (over 3-fold since 1960), meat, which increased 14-fold (6-fold since 1960), eggs, which rose over 7-fold, and fish, which increased nearly 4-fold. More than twice as much fruit was eaten. Since 1990 domestic production of cheese has increased nearly 120 percent , all part of the ongoing change (Westernization) of the Japanese diet that has been taking place over the last half-century. Today’s westernized Japanese diet represents a move away from cereals into animal protein foods. In fact, the total consumption of cereals has not decreased, the cereals are simply "processed" through livestock to provide food in the form of animal protein. What food does Japan still produce for herself? Japan could easily have been self-sufficient in food in 1960, but is now grossly dependent on the international market for food supplies. Since the late 1990s, 60 percent of food calories consumed in Japan are imported. Japan ranks about 130 in the world, far below Pakistan, Nigeria, Indonesia, Bangladesh, and Brazil in grain self-sufficiency. Production of the food staples – rice and soybeans as well as other cereals – has predictably diminished along with farmland and levels of consumption. Rice is one crop for which Japan can easily be self-sufficient. At the end of the 19th century, Japan planted about 2.6 million ha of wet rice per year, but yields were about two tonnes per ha. From 1920 to 1969, planted area hovered around the 3 million ha mark, but yields rose from about 3 tonnes/ha to about 4.5 tonnes/ha. Planted area in 2004 was around 1.7 million ha, yield being around 5.2 tonnes/ha. Planted area for soybeans was a high of over 400,000 ha in the 1870s and peaked in 1910 at 470,000 ha, but by 1995 it was under 69,000 ha. A complicating factor for adducing food needs is that soybeans are now imported as livestock feed. Self-sufficiency in soybeans has fallen steadily since 1930 and is now around 20 percent, with annual imports since the early 1980s in the 4.5 million to 5 million tonne region. In areas of Japan with fairly mild winters, and where the land was not snowbound in the winter months, winter wheat and barley were often grown on paddy land as a winter crops. Total production of wheat and barley, 3 million tonnes in 1913 and 3.8 million tonnes in the late 1950s, has plummeted to around a million tonnes or less since 1970. Japan still produces about 80 percent of vegetables, 39 per cent of the fruit , 44 per cent of beef, 51 per cent of pork, and 67 per cent of the dairy products she consumes. Self-sufficient in fish (though at lower levels of per capita consumption) up to around 1980, since then Japan has had to maintain, and even raise, per capita fish consumption by subsidizing her ever-declining fish catches with imports. Japan has gone from potential or near self-sufficiency in livestock feed in 1960 to about 50 percent overseas dependency in just under 40 years. Source: Anthony Boys, How will Japan feed itself without fossil energy? in Sheila Newman, (Ed) The Final Energy Crisis, 2nd Edition, Pluto Press, 2008, pp 354-357.